If you’re building a cross platform app and you want to use Admob in your Android and IOS apps then take a look at this component. The component is a commercial component from Flash AV Soft Corp and has a trial version that runs in the IOS simulator so you can try it for free. 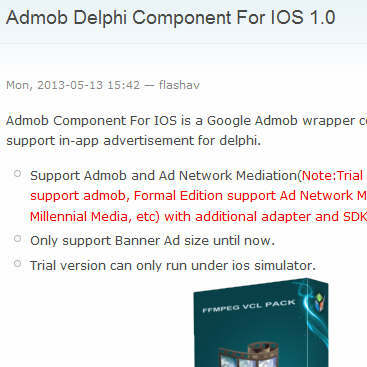 One important feature that it has is that not only does it support Admob ads but it also has network mediation support which allows you to use other ad networks in it as well including iAd from Apple. This version of the component only supports IOS but there is an Android version of the component as well. If you’re looking for an additional way to monetize your app besides up front purchases and in app payments then this could be it. Head over and check out the trial component on the Flash AV Soft site.